After stepping foot on a campus where discussion about racial issues became part of my everyday routine, race became an impossible topic to avoid. I became aware of these issues first, and then I became curious. I started to notice where they showed up in my past, in my daily encounters and in the institutions around me. I became skeptical of inequities and offenses I used to ignore, and I then started to become bothered by them. But in some ways, many of us also cherish the very identities that divide us. The student organizations we’re dedicated to, the groups of friends we choose and the topics we’re interested in are incredibly reflective of our constructed racial identities. And sometimes, those choices are more racially exclusive than we’d like to think. Among my friends, there are times I feel ostracized. I will always be the “Asian” to my white friends who probably think I hang out with too many Asians and the “white” girl among my Asian friends who see that I have little connection to my Japanese roots. Among my family, there are times I feel different. Whenever people stare a little too long in the streets of Bejaia, their gazes will always sting, and whenever I realize how much I stick out in family photos, my heart will always sink. My appearance will always be the first thing that exposes my incomplete connection to my heritage. I can’t hide that I am two incongruent halves that don’t make a whole. I just wish it didn’t suggest that I’m less of one identity than the other and that it reflected what I feel rather than what others see. So I hate labels. They all omit so much background that none of them feel authentic to me. Racial categorization might not seem misrepresentative to people who fit into a racial category that more or less corresponds to some common ancestry and cultural background. But what about those like myself with ancestry from multiple parts of the world? What about those of us with a racial categorization that doesn’t match the cultures we feel the most connected to? What about those of us who want to check multiple boxes and add an asterisk to explain generations of family history that a checkmark can’t do justice? What about all of the other multiracial people out there who have complex family trees and genetic composition, yet are still arbitrarily categorized into either a single group or lumped into the most undescriptive category that we label “mixed”? In the United States, nearly every culture in the world is represented. Our diversity is our greatest strength. And as generations pass in a heterogeneous society, cultures blend. People of two or more races are now the second-fastest-growing racial category in the United States. And as this multiracial population grows, the typical racial categories that we use to count populations and conduct sociological studies are becoming obsolete. The genetic research that has taken place post-Human Genome Project has proved over and over again that race has little meaning at the genetic level. There are no true unifying genetic characteristics between the racial or ethnic groups we’ve constructed, and many of us have DNA more similar to those in other racial groups than to those within our own. The relationship between heritage and genetics is complicated — it seeks to make connections among people with ancestors from multiple geographic origins, populations without clear lines among them and racial categories without any genetic meaning. Our identities are often defined superficially rather than biologically — yet we are much more similar as a human race than our family histories, ancestry DNA kit results and existing social structures would suggest. While the geographic origins of our ancestors do leave some genetic imprint, and while our cultural backgrounds do shape us internally, race is a social construction that will always be independent of both. So we have it all figured out. By now, we should have eliminated all race-related terms from our vocabulary, deleted all racial inquiries from surveys and begun to undo centuries of injustices. And yet, because social change will always advance slower than science, race still means everything in our society. Sometimes I now find myself turning away from student narratives that primarily focus on race. Since it’s something that many of us can always fall back on, we end up producing variations of fundamentally similar stories. Silently, I complain about how repetitive these stories feel after four years here. But here I am, writing the first installment of a weekly column about race. Because in our society, these categories still means everything. Because history has repeatedly restricted arbitrary groups of people from suffrage, employment and basic human rights. Because we’re still judged, restricted and labeled within those groups. And because no matter how much we protest, and no matter how much political art is created, and no matter how much we spread our opinions through social media, there still may not be anyone listening on the other side. I am constantly inundated with racial discussion. I hear nothing but debate about oppression, representation, equality. And sometimes it feels like so much futile shouting that I become desensitized to the meaning behind the words. But after four years of continuous exposure, I’ve seen how crucial every individual voice is and how far collective voices can project. Repetition is necessary. We don’t just talk about racial issues because it’s the only thing we have to say; we talk about rac because it’s valuable. We’ve still got a long way to go before we start changing how we think about labels. So I guess this means I’m going to have to start shouting, too. 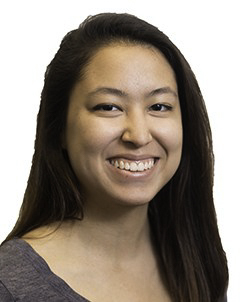 Jasmine Tatah writes the Thursday column on having multiple cultural backgrounds in America.